I really like the idea of introducing or reminding a culture character through a souvenir, therefore I’d like to design interesting local souvenirs as handy gifts for this exhibition. My strong impression of Tainan was the friendly people and the orange brick walls all over the town. It’s a town of history and orange color. 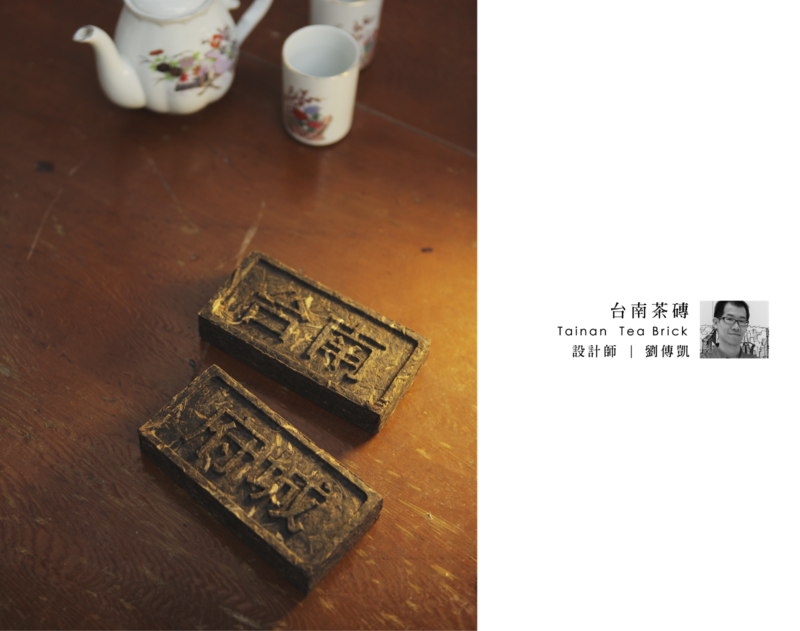 I decided to design a series of gifts/ souvenirs with a single brick form to well represent Tainan. Concept 2, T-shirt Brick: The weather in Tainan is rather warm and hot. A simple T-shirt can be wear through different seasons. I was thinking to make the t-shirts printed in selected Tainan historical tour sites as gifts for young audiences to get to know the town. 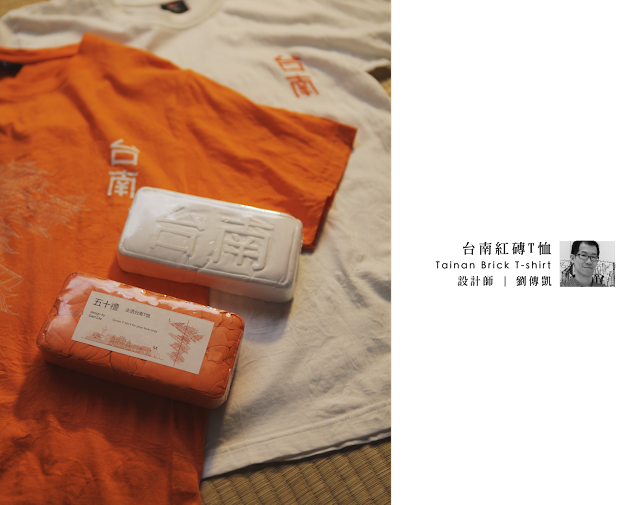 Through a high- pressured vacuum forming , the t-shirts can be packaged like a brick. During our Taiwan trip in April 2011, my wife and I visited an old shop selling traditional Chinese ink brushes. The feeling of primitive simplicity filled the shop and this impressed upon my memory. In the first evening of that trip, we rambled around a street in the city and were attracted by a banner of a shop. The banner indicated the shop as a shoe hospital. In fact, the shop provides shoe repairing services for people. This was rather funny since we had not ever heard of a shoe hospital. After that, we started paying attention to the banners of other shops there. 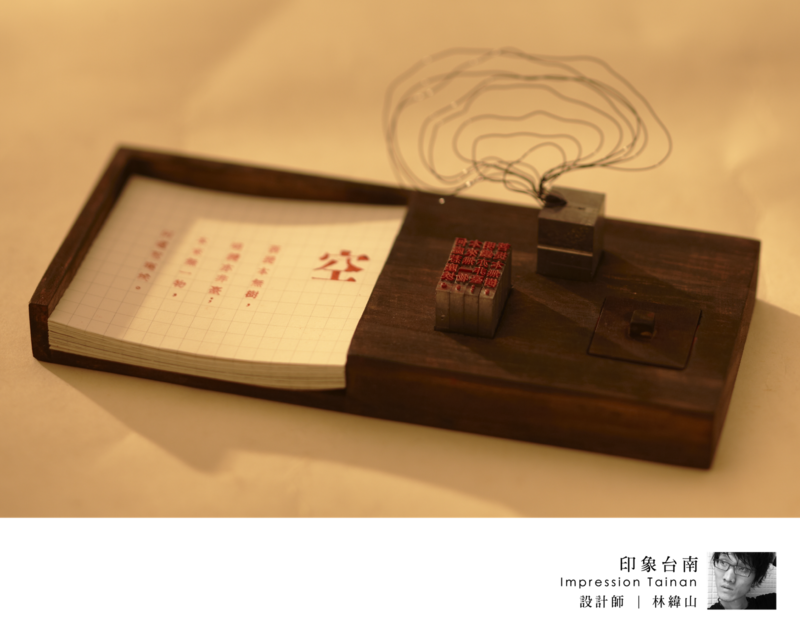 We found that they all looked very interesting and special not only because of their meanings, but also the style of the Chinese characters. We were used to write on copybooks when we were youngl. We might start with some very simple words or phrases. Yet since the phrases were mostly written in very old style, we might not even know what they mean. In De Tainan Stijl, the banners appear in Tainan are recorded. They all reflect the culture and living style of the city. 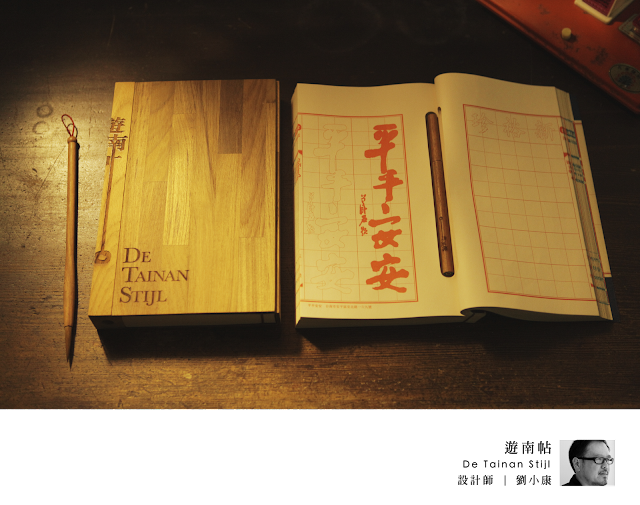 I hope this little copybook will help promote the special typographies on the shops' banners in Tainan and lead to a brand new style of Chinese calligraphy. When I first got to Tainan, the cycling culture made a big impression on me and I thought cycling was a great way for people to discover Tainan. as a result, I came up with the idea to design a bicycle specifi cally catered to ride the streets of this city. 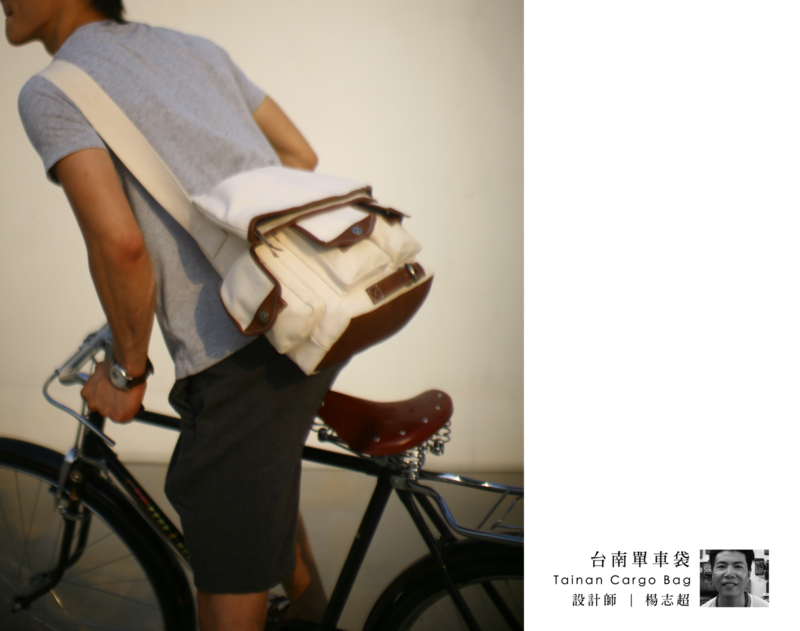 However, once I realized that it would be diffi cult for tourists such as myself to carry something as large as a bicycle home, I changed the design brief from designing a bicycle to designing bike accessories that highlight Tainan’s characteristics. During the trip, we went past the old charismatic “Wing-Shing canvas workshop”, which inspired me to work with this local canvas workshop in creating this canvas messenger bag specifi cally designed to be used on and off bicycles. I was very impress with what was done to this wall. This inspired me with the thoughts that there is always a way for renewal. 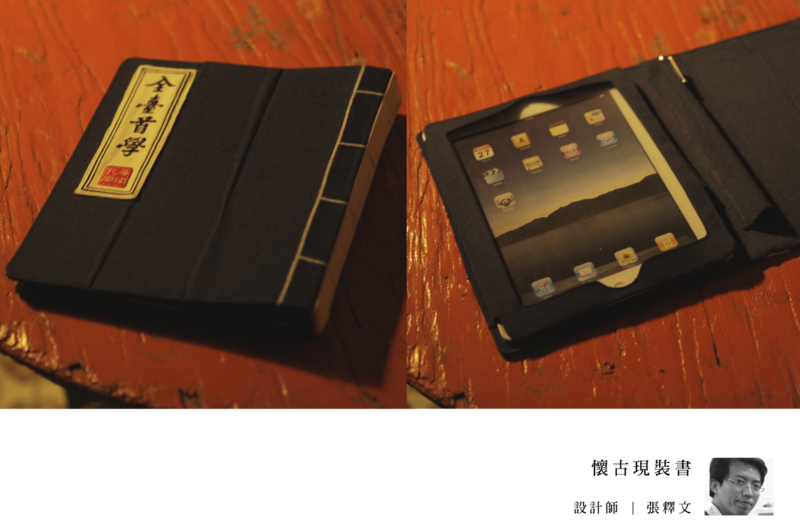 My friends in Taiwan has shown me that there is always a way to make old thing new again with a touch of class. In this instant, I want to emulate the thoughts behind this inspiration. I wonder how I could create a gift that should remind us of the ability to renew oneself like what this inspiration has done. I am looking at a blatant translation of this work. Hence I thought about how I can embody this wall into something tangible. As I search for objects in Taiwan, it seems that planters make the most senses. Growth is always about renewal and with growth changes will occur much like this wall. I am sure it has seen many changes, from it glorious days to the decay and then renewal. 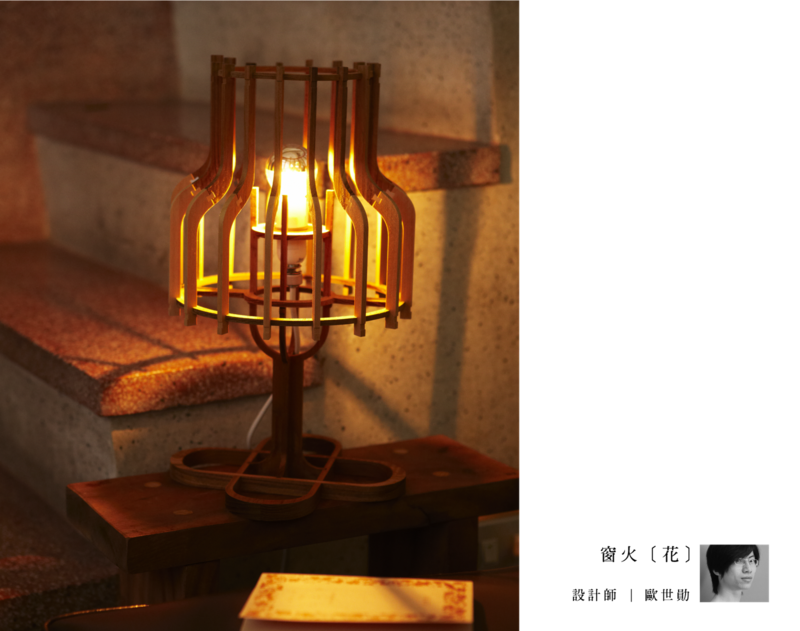 The Candle Stand represents my first impression of my experience in Tainan. People in Tainan are so friendly and I had a great time. 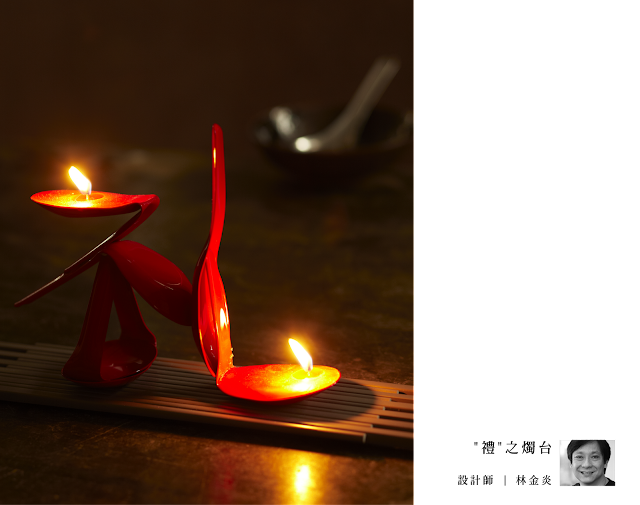 This candle stand is an interpretation of the friendship we shared over a meal. It is overflowing and cheery, as shown in the color and the texture. I hope that my friends in Tainan will feel the same way I do when we sit around the table for a meal over a nice candle light. 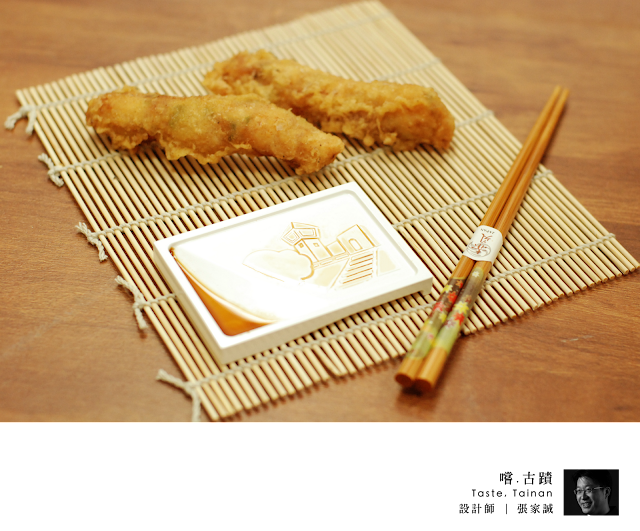 To a Tainan native living overseas, nothing is more reminiscing than the warm memory of savoring the humble yet aromatic hometown snacks. Rice dumplings, rice cakes, taro cakes and bowl rice puddings - not only are these popular snacks with distinctive flavors, but also with unique forms. The idea was to extract these varied forms, transform them into basic modern forms and infuse them with fitting functions. 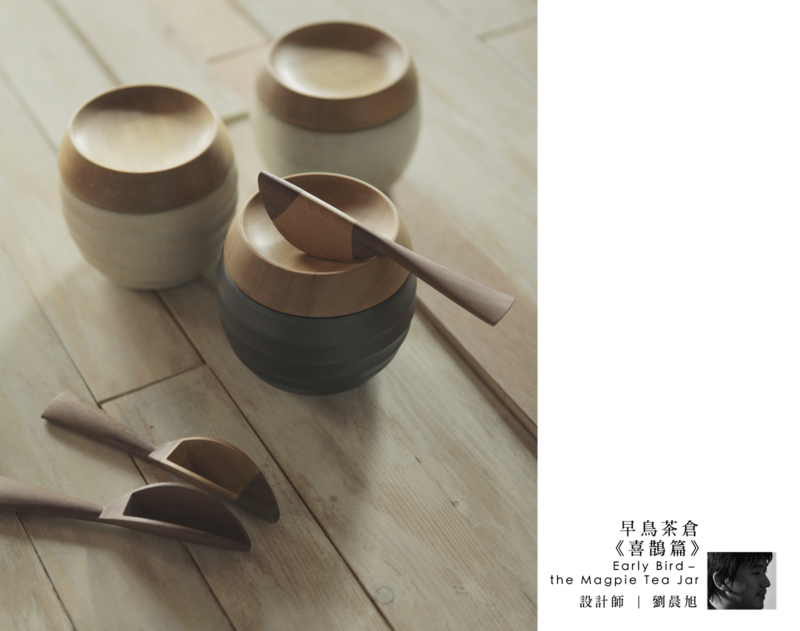 The outcome is an ensemble of desk containers which hopefully serves as a reminder of the rich Tainan food culture, while expressing the good-wishes from the giver of these gifts to the receiver. 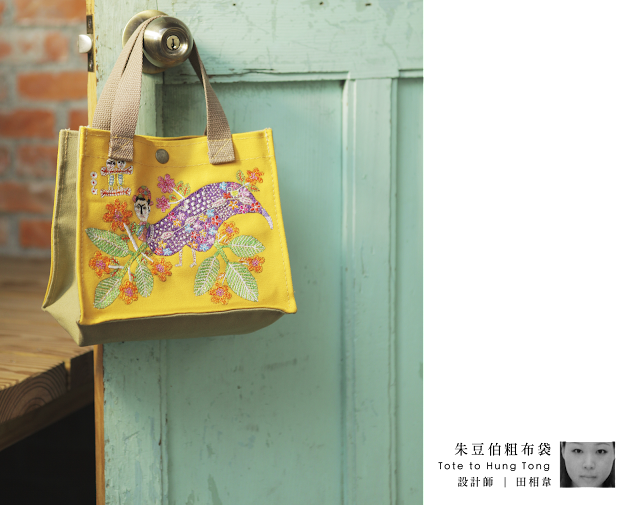 The traditional embroidery in Tainan is not only present the elegant embroider craft but including the faith of peace and lucky. This design combines the postcard and traditional embroidery to represents the fancy greeting, and the unique handwork embroidery also reflects the traditional craft in Tainan. 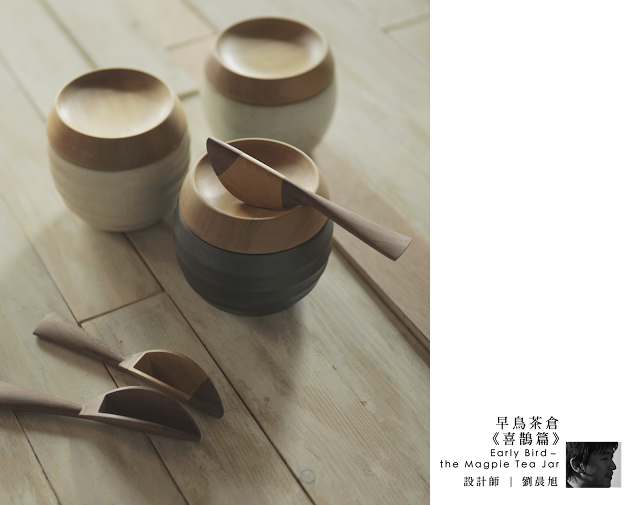 The tasty local snack in Tainan is a symbol of culinary culture, the knife, spoon and chopsticks in this tableware set are designed especially for the Tainan local snack such as meat ball, rice cake and rice tamale. Moreover, there is a food map in the back of the pack to help the people find the local treasure food and record it! The original and authentic canvas bag is an significant craft industry of Tainan. 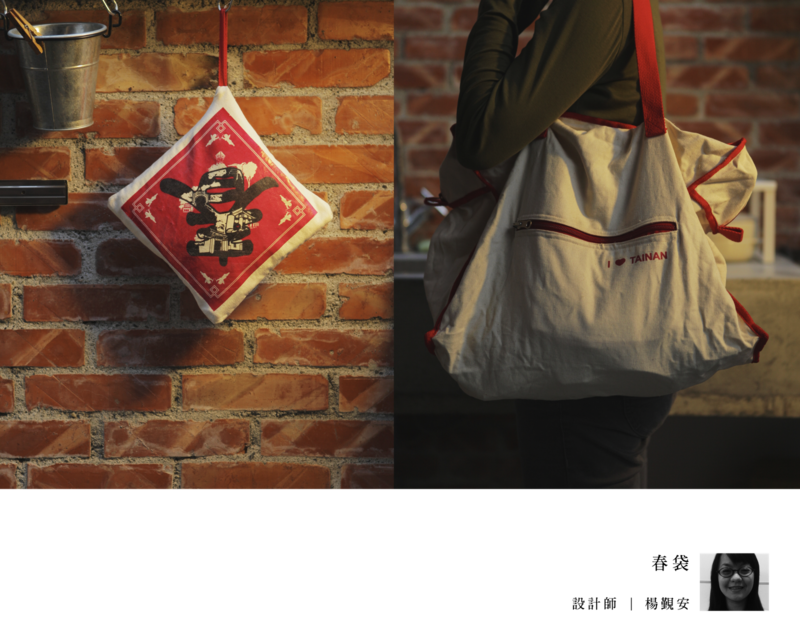 The characteristics of the canvas bag also represents the sincere image of Tainan City. 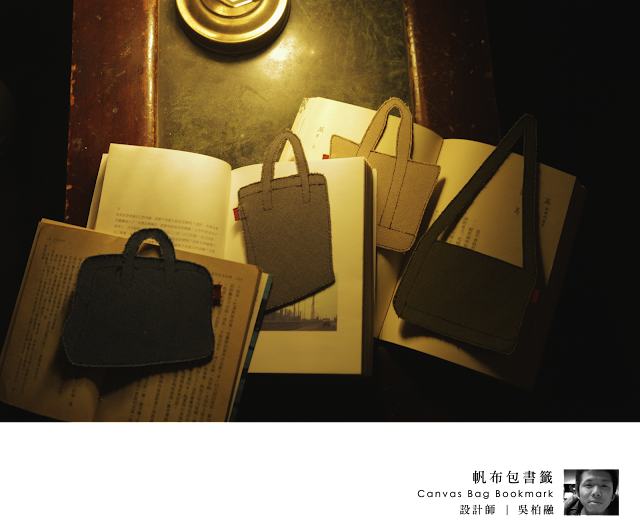 The essential and simple touch of the canvas bag which is originally used for packing books, is now being packed in a book. 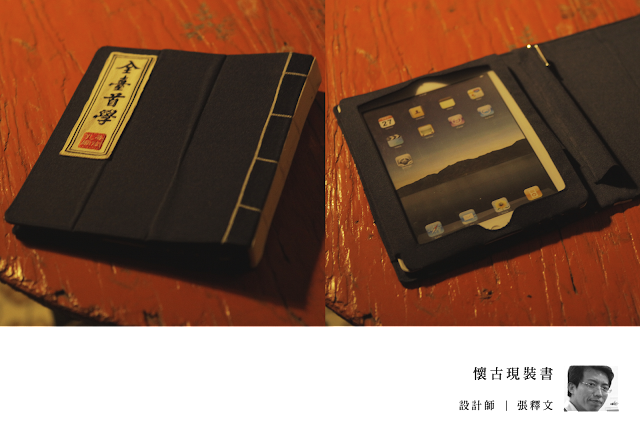 Families or friends who receive the gifts will perceive the warmth from Tainan while reading. 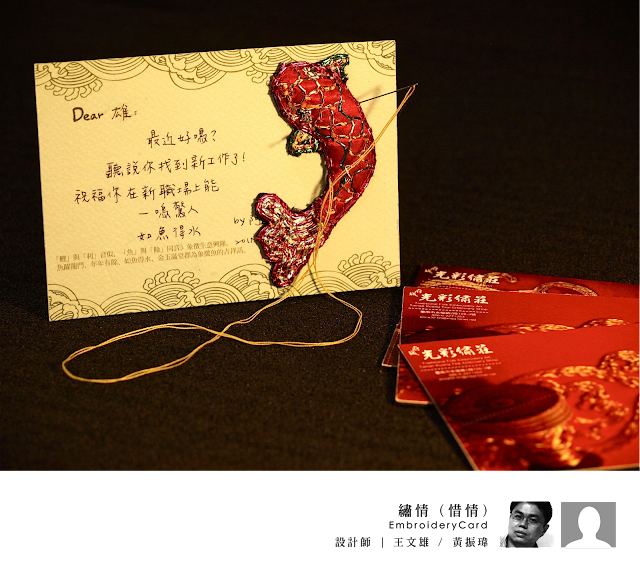 Kids' cannot get more excited than receiving red envelopes during Chinese new year celebration ; what could the spirit of "red envelopes" bring to the society other than the " new year money"? 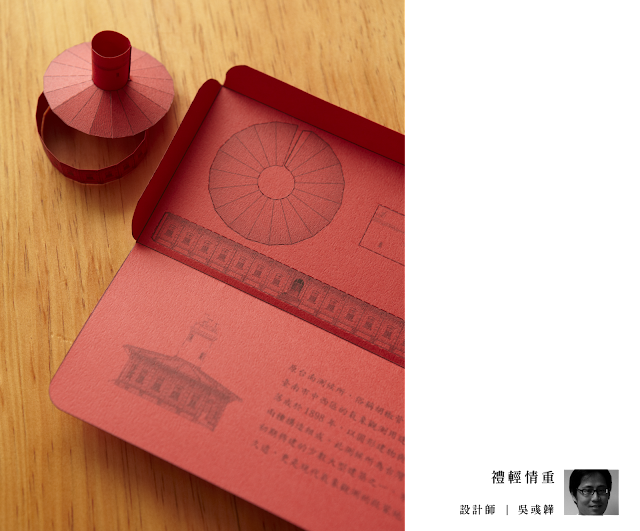 The idea is about connecting the traditional Tainan houses with red envelopes, on the other hand, representing an extension of social and cultural heritage. It is very well known that people in Tainan is very friendly and enthusiastic. 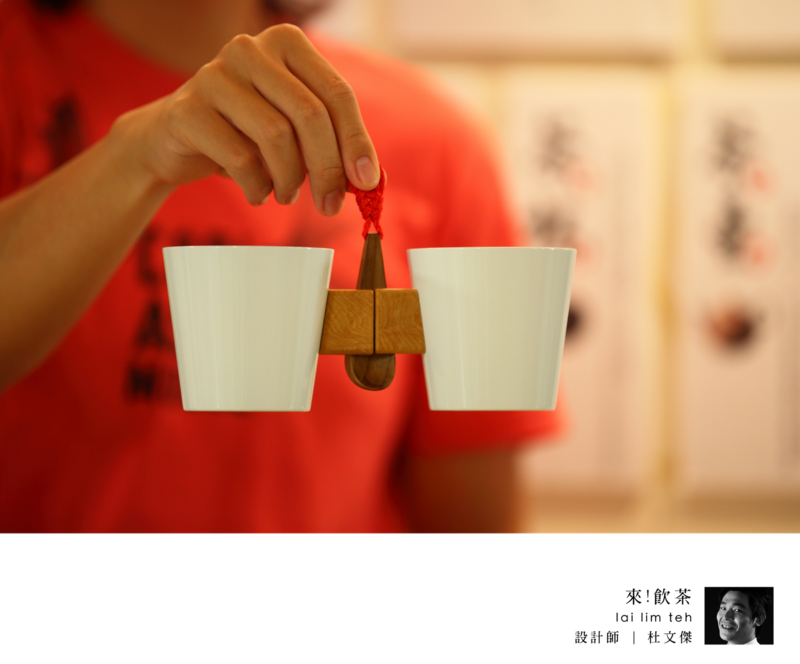 Through the cooperation between my cup design and a local teashop (Tea Serving), we converted those accompanied cups full of the spirit characteristic of Tainan people into presents, which allows residents in Tainan to spread local culture and the story of a historic city. Tainan is the first development city of Taiwan, has a tangible sense of history and traditions; it is a multicultural city, gathering different style of architectures and lifestyle, become a unique atmosphere city. Old Asakusa mall is a place with such style; it is the legacy of Japanese colonial era building, a commercial place for different trades, especially for cloths, walking inside, still can feel the prosperous back to the time. Now days, only few fabric shops with lights on, telling the stories and showing their vitality in the midst of the depression. 【Bigibu】represents a story of Tainan by using fabrics which relate with the city history. 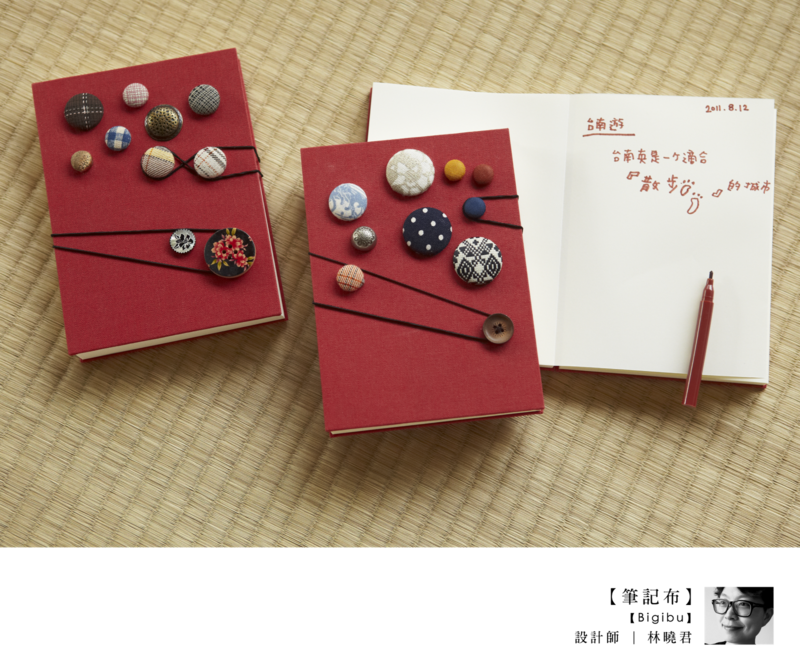 The cover is Tainan’s symbolize colour brick red, place on buttons made of feature fabrics, with a rope can play around the buttons while open and close the notebook, the idea behind it, would like to encourage people to explore and experience Tainan via five senses, and recording down the journey by【Bigibu】. 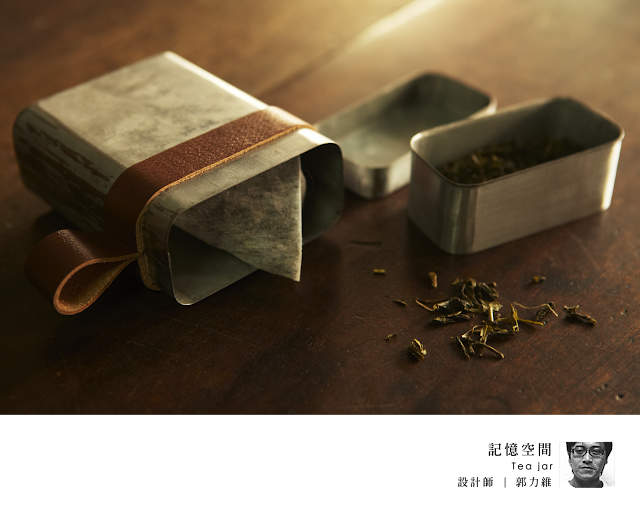 The hand-wrapped tea is the most striking features of a century-old ZHEN FAT. 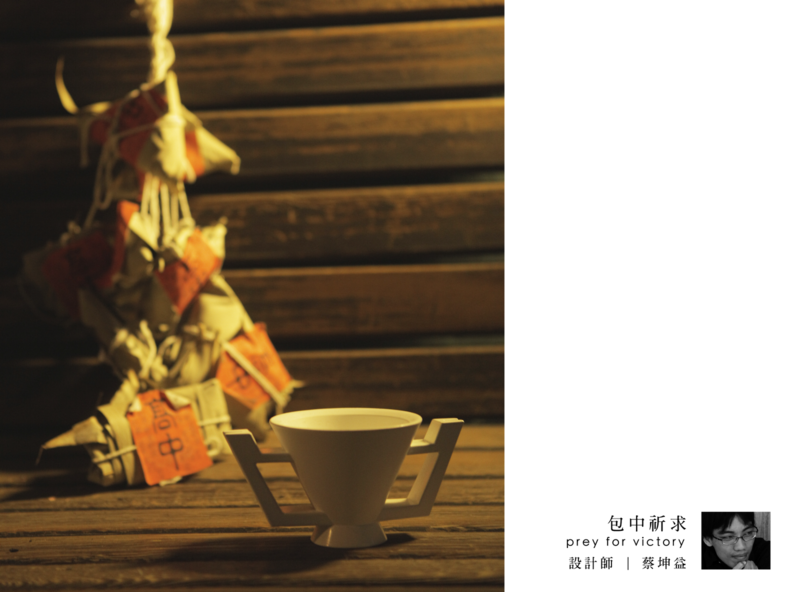 Through the process/ steps of wrapping the tea, the expression of dedication and sincerity have been conveyed to the people. 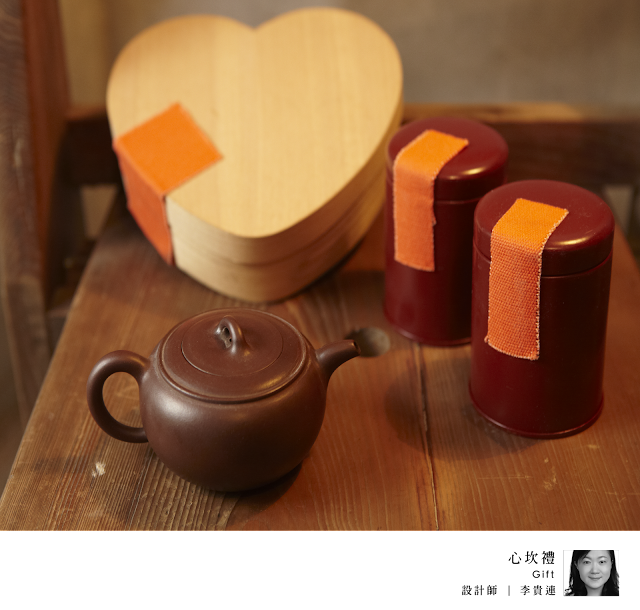 The design of the tea set has revealed the characteristics of Origami, even if the packaging has been opened and discarded, the tea set is still continuing to convey the spirit of the tea company/ house. There is Taiwan's most famous food in Tainan, so we design tableware for food_sauce small dish. 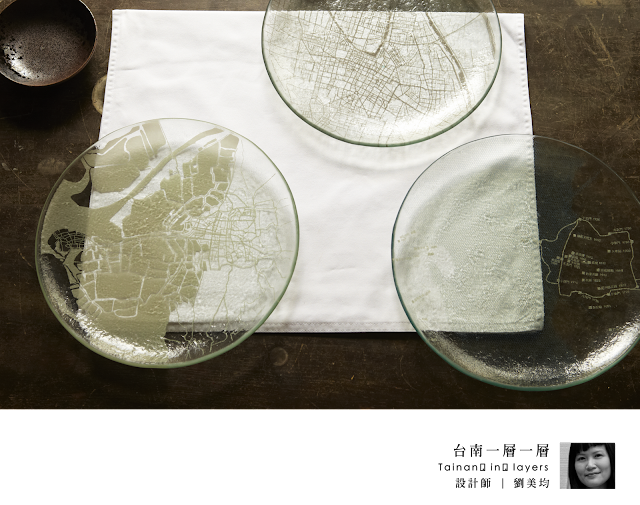 The design concept comes from food ideation, it combines Monuments and the scenic in Tainan, not only can prevent the sauce use too much, but you can also see monuments and scenic spots of Tainan in the dish, just like you can test Tainan scenic. 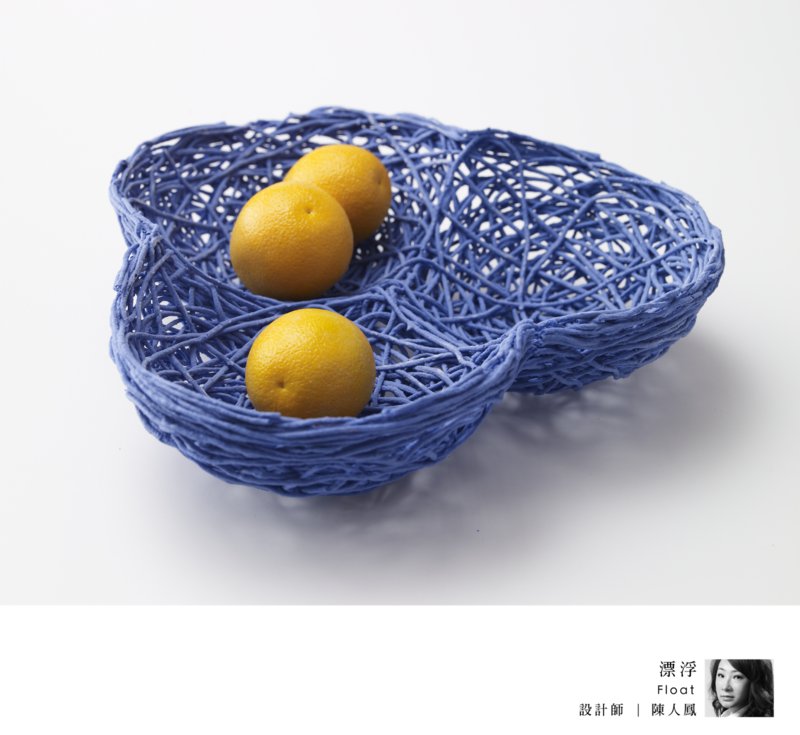 It is quite troublesome when it comes to gifting since it might be impractical or just too expensive, that is why I design household supplies to slove this problem. Soap and towel are the traditional primary presents. I changed the shape of the soap to triangular pyramid, and transform the appearance into Zong Zi (rice dumpling) by covering the soap with towel. The angles of triangular pyramid could be used for massage purpose. 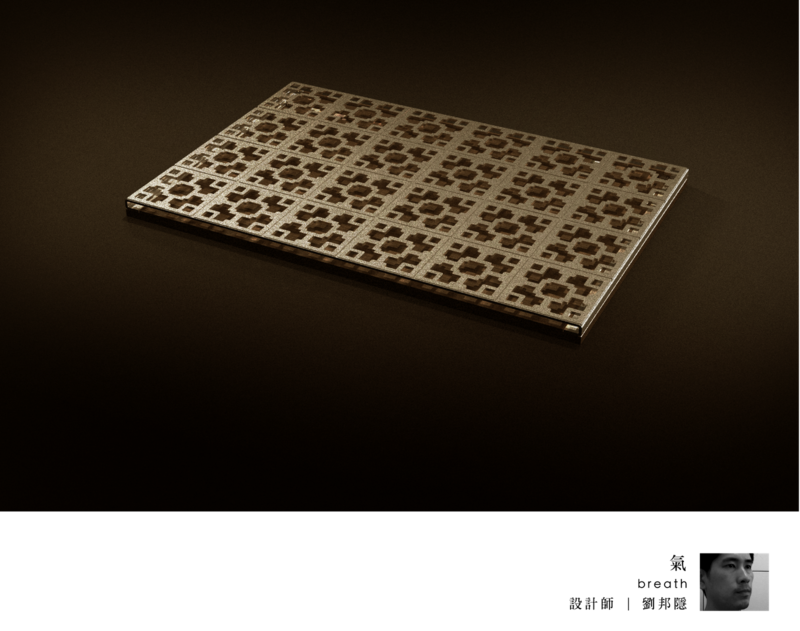 Grille is an important, traditional symbol of Taiwanese life and has been an intergral part of the Taiwanese landscape for decades. In Tainan, one can still find and see many of these traditional grilles, but sadly, this type of custom-made grille is rapidly dissapearing in favor of cheap mass-produced grills. As a result, the craftsmanship of creating these grills is dissapearing. Fruit store has been a great dating location for elder residents in Tainan. Cut fruit plate is a characteric dish in Tainan, especially the ginger tomato. When the tomato was dipped into the mixture of thick soy cauce, ginger, brown suger as well as licorice powder, perhaps only those who had taken a bite could experience the deliciousness of that sour and sweet with a bit of sharp taste of ginger. Therefore I designed a rounded dipping plate with special recipe, tourists could easily follow the procedures to reappear the good taste of Tainan. Almost none of the fruit dressing needs to be fully stirred, hence I used the rounded plate to underline the specialty of ginger tomato. Layer by layer, the glass plates manifest the changing lanscape of Tainan. 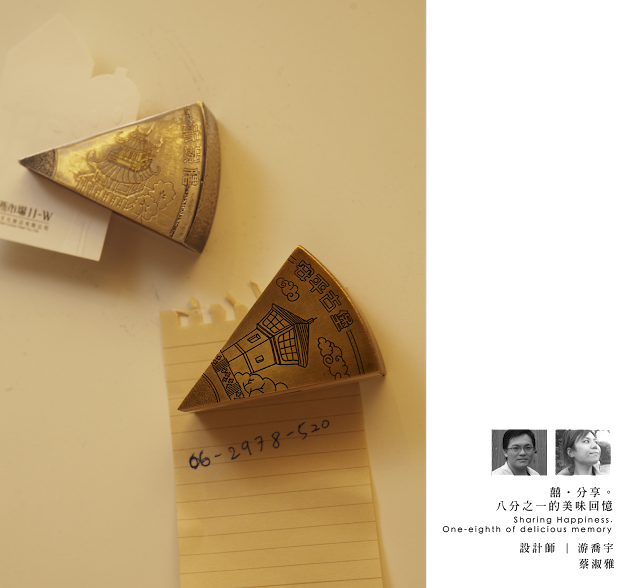 By stacking the map-engraved plates, one can read the city history across the centuries. The old Tainan city owns many gates. Get a gate bag and visit the gates! From here to here. It’s right here. The nature has given the Tainan oyster culturers the most valuable gift and makes it the most famous and important cuisine business here. To honor the oyster culture in Tainan, we use the shining shells of oyster combined with eco-friendly cement from the local to perform the condensation of time for making the tiers of different materials. I walked around the street at Tainan City and toke a collection of the grille on the windows. Those are the faces of the city, also the faces of home. 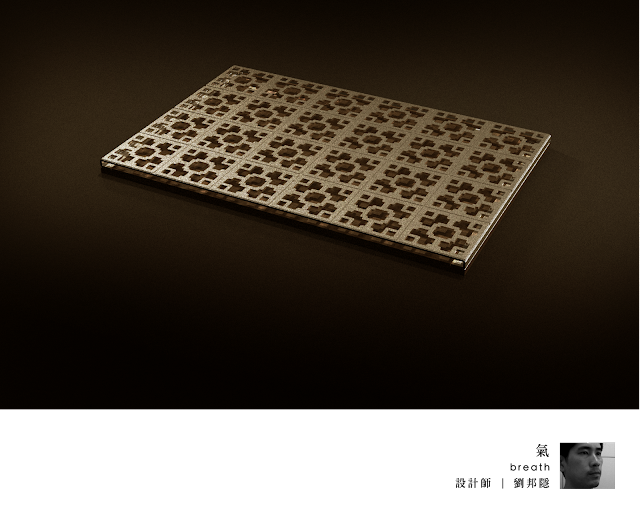 The style of every grille reflect the dream of every family: wealth, lucky, pragmatism or romantic. 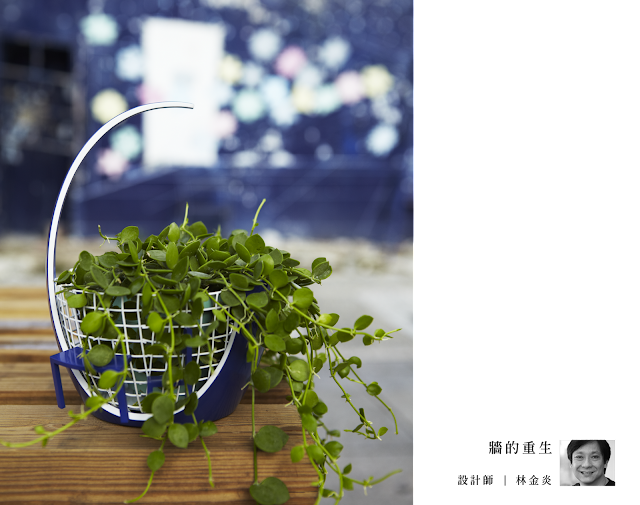 The grille not only have the function of protection, but also the personality of Tainan City. kesi bag – A design concept derives from both the specific culture of Tainan and the my emotion with objects. Tainan is a place where deeply influenced by the western culture and still obsesses plenty of historic spots. 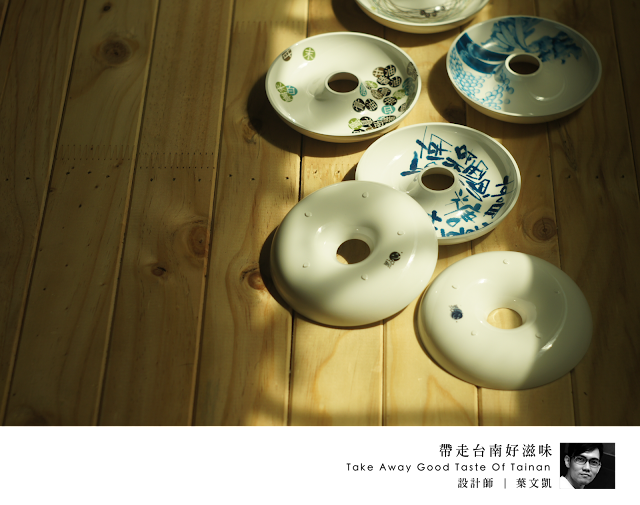 Special cultural fusion can be easily found in Tainan such as architectures and furniture. 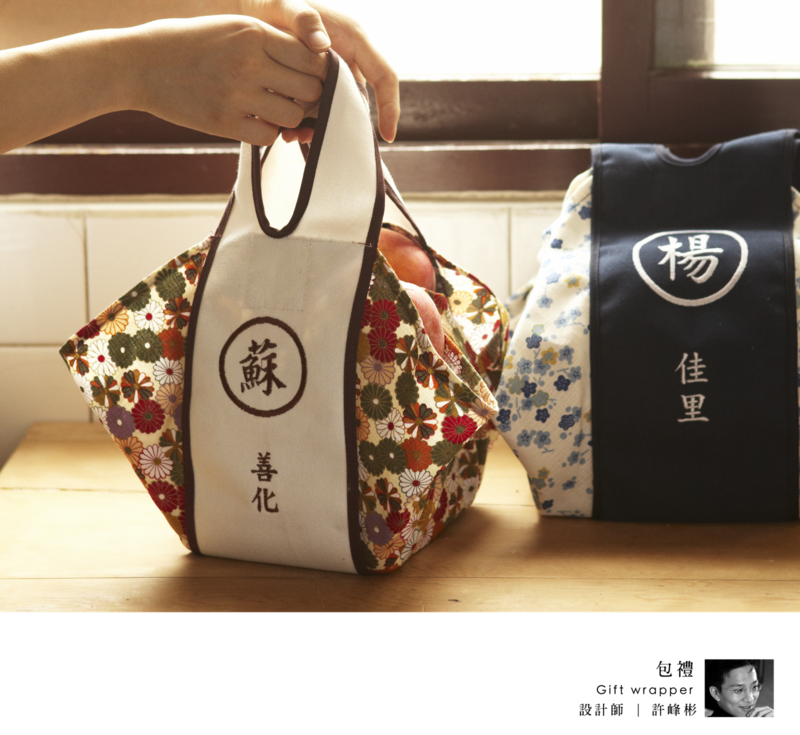 Canvas bags from Tainan also recall our memories of childhood. 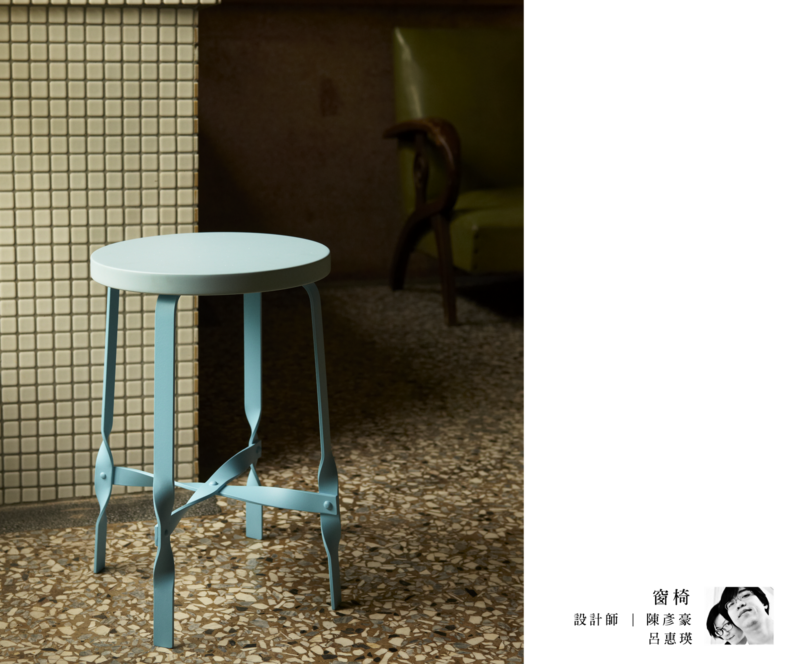 It’s a symbol of simple style and a gift with craftsmanship that you will like to have one or share with your friends. I started to redesign bags which can meet demands in our daily life. 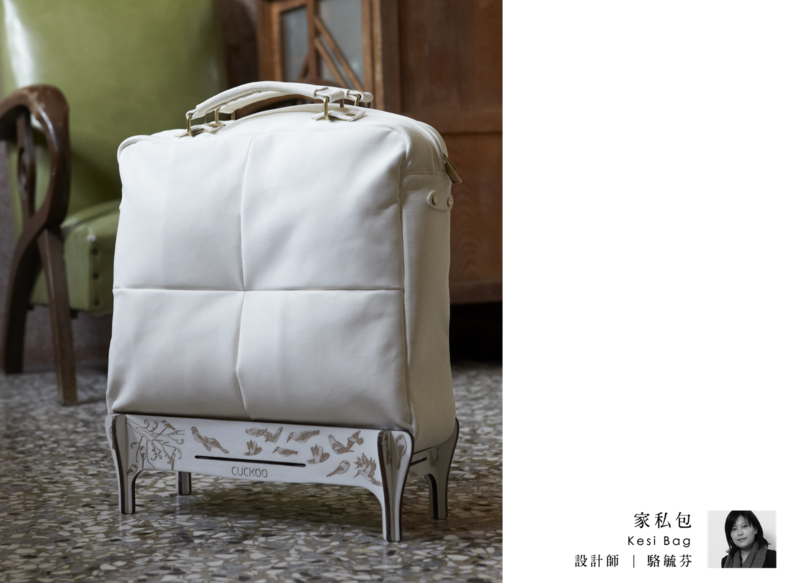 With adding the legs of traditional furniture to a canvas bag, you can feel free to put the “kesi bag” on the ground and ease your burden anytime. Tainan Castle Town is famous by the variety of fine foods. 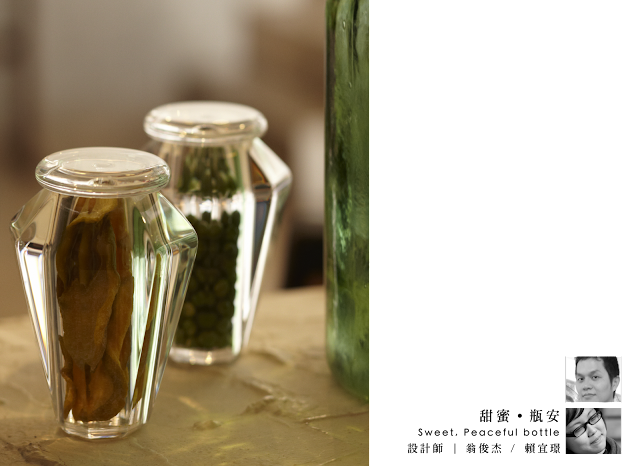 Makes every traveler can’t forget the specific taste. With deep culture smell, the touched burn on the beat of soul. So we come back here, want to deliver some memories of taste, to ourselves, maybe far away or pasted by. 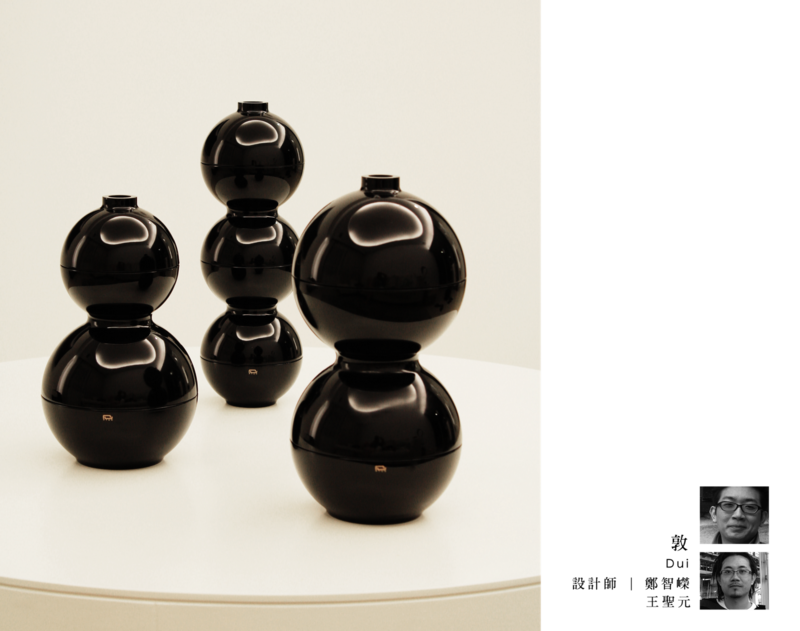 The bottles filled with fruits preserves, using Lacquerware to rebuild the molding of the Pot of AnPing. 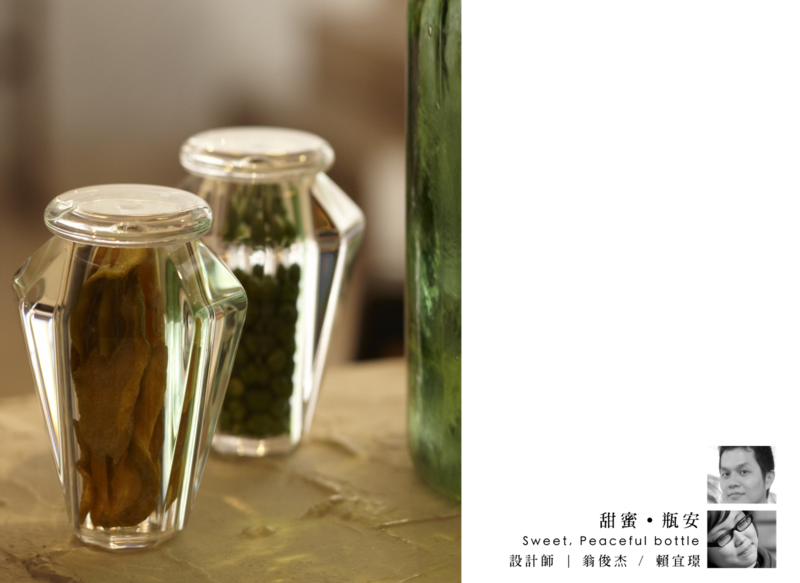 Because of the sweet fruits preserves carry out and the pronunciation of AnPing to peace. Makes gifts not only gifts but full of great meaning. Sweet memories, Peaceful travels. Among these common people’s diet culture, the most representative one is rice: the delicious salty rice pudding with oyster on it, is just steamed. The traditional snacks which sell by the food stands in the alleys are etiquette for guests. The Japanese engineer, Hatta Yoichi, complete the Chianan Canal irrigation system of Chianan Plain of Taiwan, and the canal became a precious gift for South Taiwan. The Chianan Canal made agriculture grow much better than before, and made Chianan Plain became the largest granary in Taiwan, and indirectly leads to Taiwanese’ rice diet culture. The “rough rice” series is created with the on-the-spot-record-photo.The designer hopes the product could represent the minimalism. The name: “Spring Tilling, Summer Hoeing, Autumn Harvest, Winter Hide” present a sincere gift, which is reserved, cross different and multiethnic region. A group including 4 cups or nine cups, when does not use the buckle puts in but actually the tea tray, floats by the base engraves is composed the Confucian temple, or Fort Zeelandia. And so on graphs, usually may, when suspends the decoration to use. 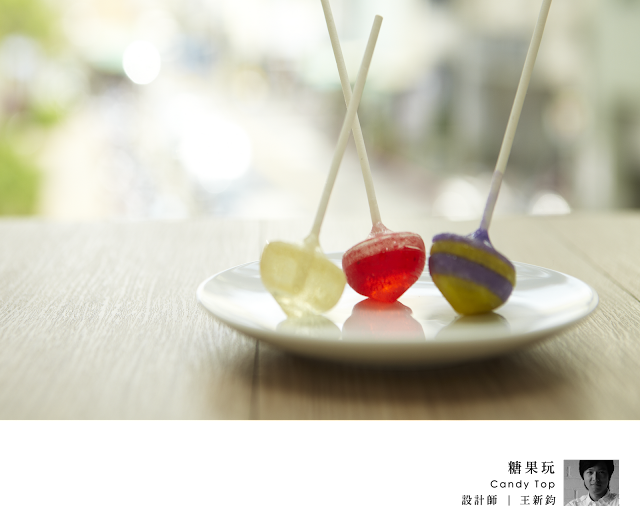 By simply adjusting the profile of the traditional Lollipop, new power has been applied to the existing well-recognized object. The theme of my design is the aroma of Taiwan cypress that represents Taiwan’s fragrance. I wish to deliver the warm and kind of Taiwan cypress ring and the uniqueness of Taiwan cypress’s aroma. 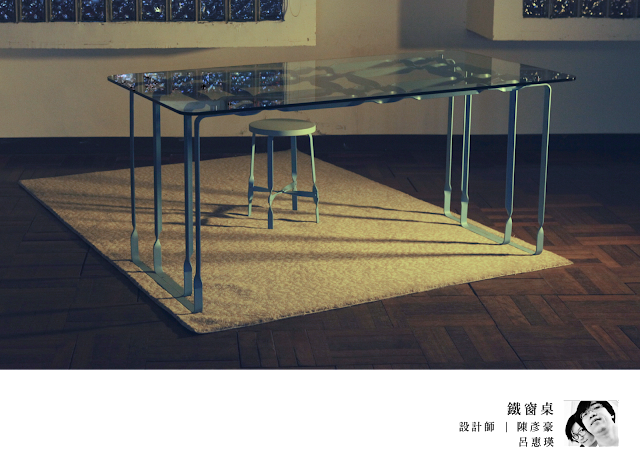 Bodhi is fundamentally without any tree, The bright mirror is also not a stand. Fundamentally there is not a single thing, Where could any dust be attracted. Temple culture in Tainan is pretty impressive. 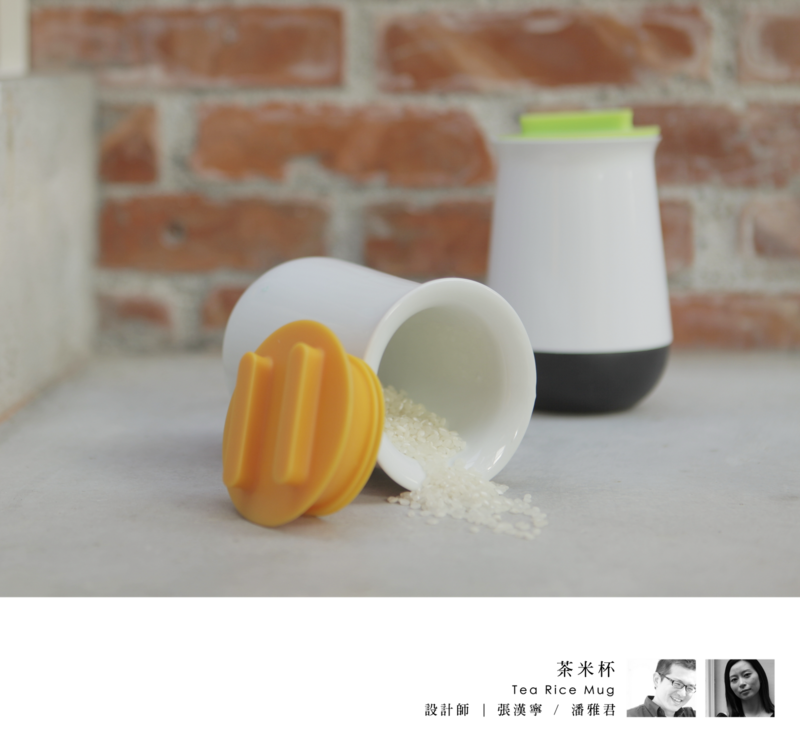 A unique product and the traditional lifestyle grow from the unique architecture as temple. A commitment to spirit is what people are looking for at Temple. Such as getting a lucky bamboo slip for people is going to have an exam as a good luck wish; praying for a good relationship by wearing a red thread; hoping to have a safe trip by carrying a lucky symbol. This is the local temple feature in Tainan as well as the Taiwanese characteristic. My design concept is: People’s blessing can be delivered easily through these carry on adornments. Made of porcelain and silicone, this urn like little Tea Rice Mug is a neat packaging box exclusively for Tainan rice. 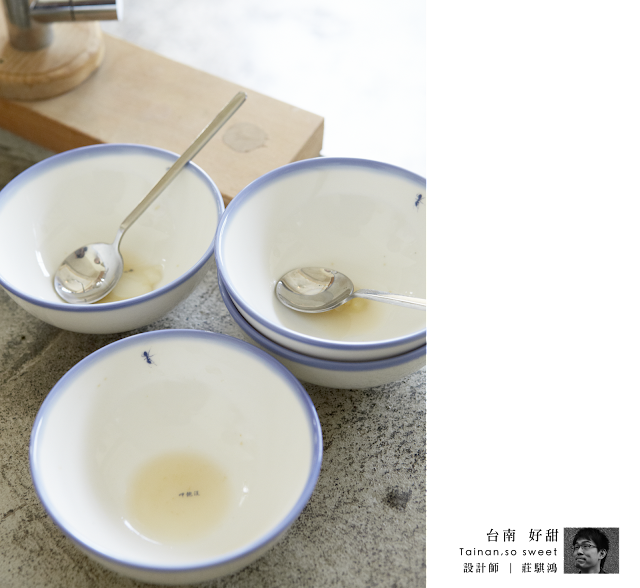 As the rice taken out of mug it can also be used as a Tea Cup of which the name of Tea Rice Mug is derived. Whenever we go to travel, we also want to share the fun of travel with someone who can’t come with us, and usually bring some special stuff as a gift. In addition to historic monument and citizen lifestyle, there have many kinds of delicious food in the cultural capital. In the past, the sugar symbolizes nobles. “The food is so sweet” made a general impression in Tainan cuisine. Even as times change, the culture would be passing down. Using ants crawl toward the food means the food is so sweet and feeling so sweet when received this gift. The gift can be a casual sharing, such as a bag of fruit, sub-specialties, even a newly caught fish can be a souvenir. As souvenir can be anything, why not design a convenient and styled packaging . Not only design to replace the plastic bag or gift packaging, but increase attention and gives more meanings and personal identities. 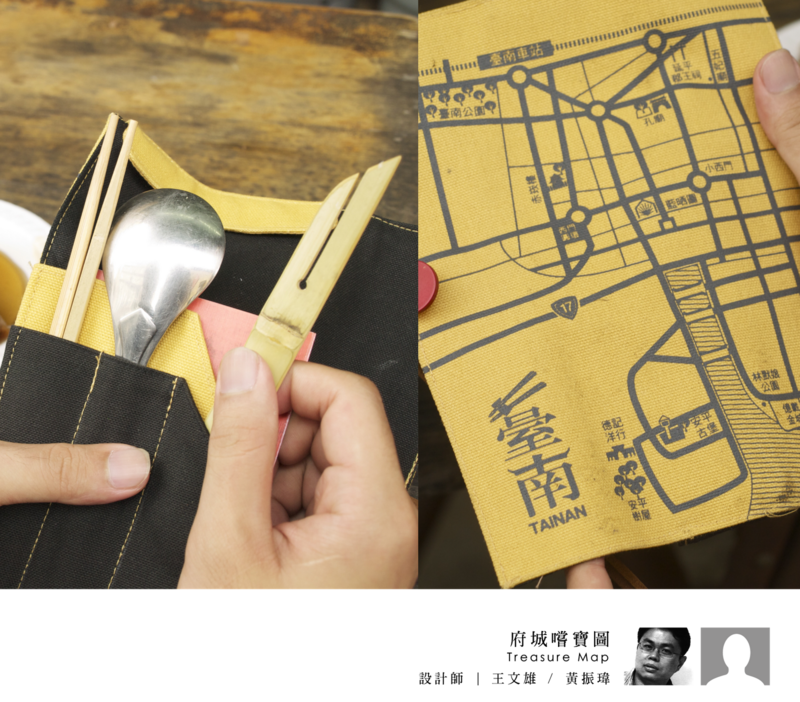 The main concept is the use of the Japan's burden with canvas, to create a new reuseful package or bag. 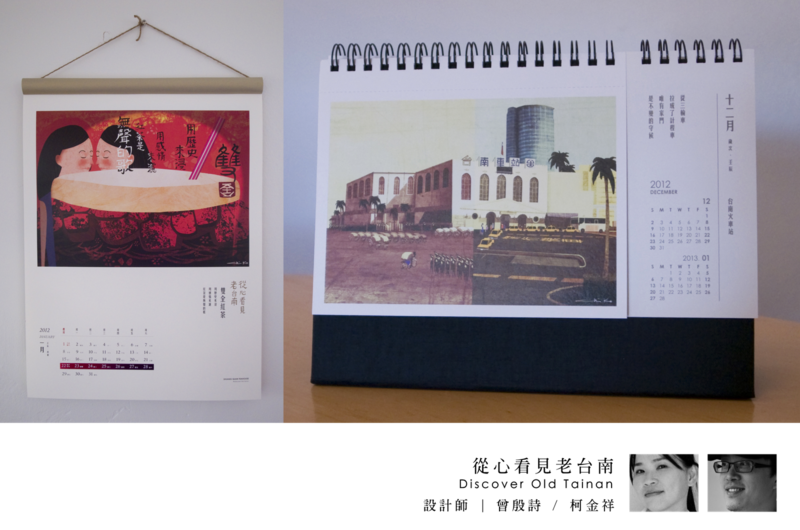 With different themes and color printing on it, can display the different characteristics in Tainan. Identifying the meaning of sending gifts back to casual sharing, but retains a degree of caution. Inspired from light-as-feather cotton candy, transforming its thread-like construct into a shape of airy texture, the vase sheds off its otherwise commonness and puts on magically glamorous appearance. 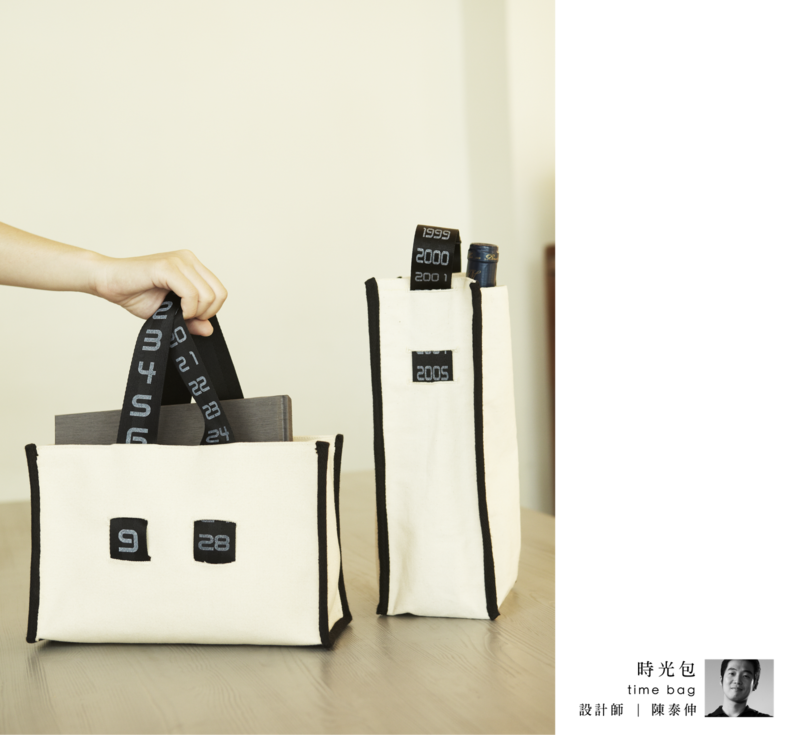 Made of canvas, the Time tote bag features the adjustable straps that can tell time so it can hold diverse objects which link to the date shown on the straps. By carrying this bag, users can easily record or get reminded of all of their important dates, such as a wedding anniversary, birthday and so on. 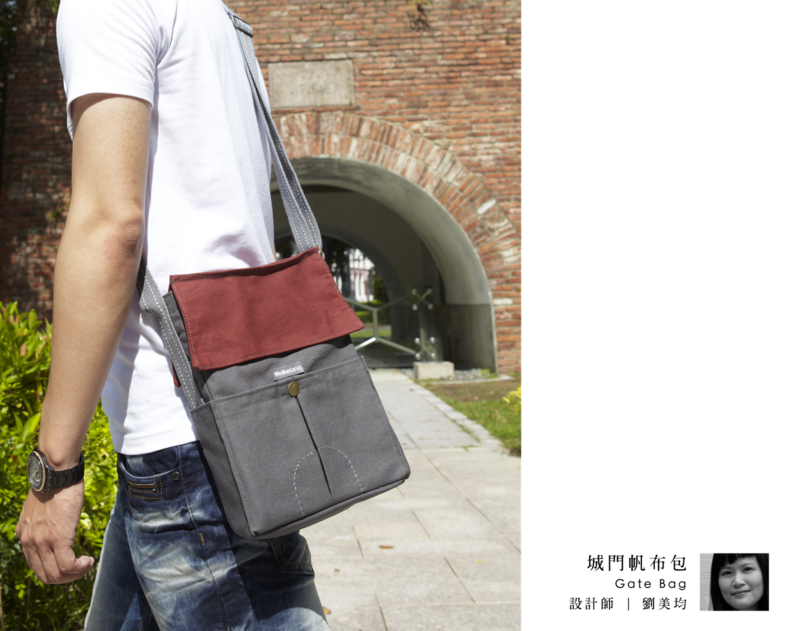 Thanks to its small size, the bag can be used as a desk calendar as well. It is a local custom in Taiwan to share one’s happiness of marriage by giving out wedding cakes. As a little boy, I remember my grandma being particularly happy when she received wedding cakes from relatives in southern Taiwan.“Wedding cakes from Xiagang (alternative reference to southern Taiwan) are just tastier, especially those from Tainan,” she said. Grandma would then draw a knife as we looked on with anticipation. Slicing the wedding cake into eight pieces, she would hand one lovingly to me, her eldest grandchild. The greasy sheen of the cake and the fragrant smell of its contents mesmerized me. The satisfaction of the bite and the rich sensation it stirred on my taste buds became a cherished childhood memory. 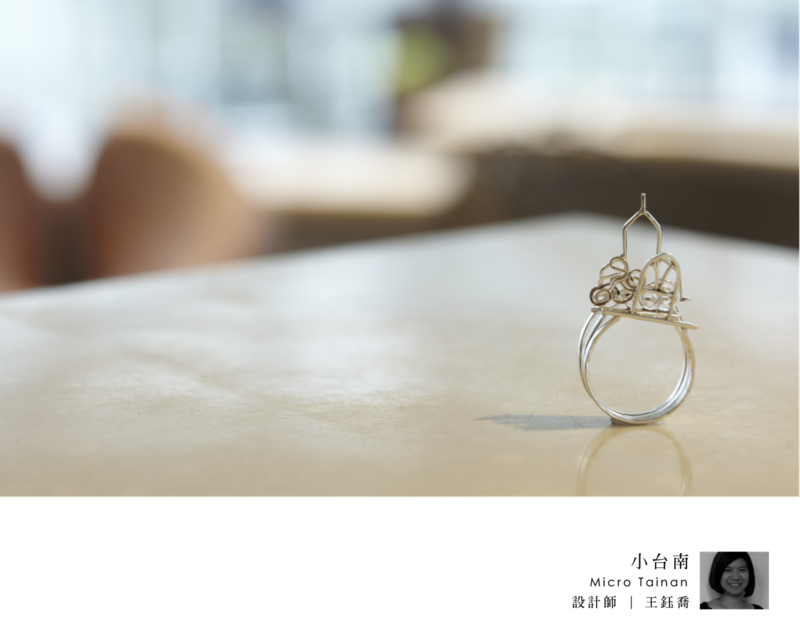 Inspired by childhood memories of eating wedding cakes and the love story of a newly-wed couple, I map out in my design eight famous scenic spots in Tainan which witnessed the relationship grow from budding love into marriage. Each of the eight sites represents one-eighth of a delicious memory. 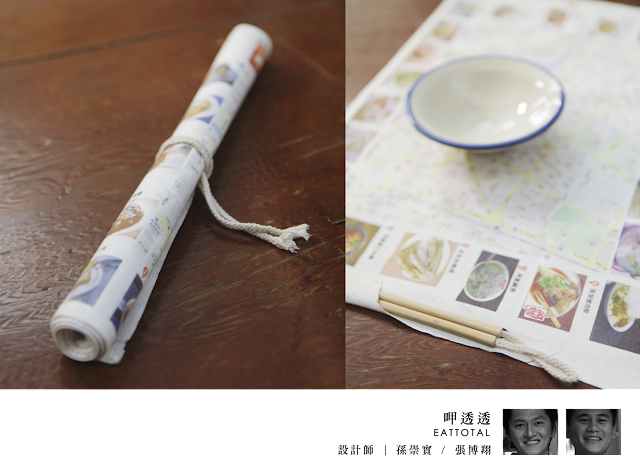 Tracing their tracks and recounting their story through the form of a map, this piece doubles as a memo folder that captures the local scenery of Tainan. Human civilization are derived from the river and the "five ports" is the reason that making Tainan prosperity and development. As time goes by, Tainan presents diverse style and character ; however, it's never change the unique lifestyle and life attitude of Tainan people. 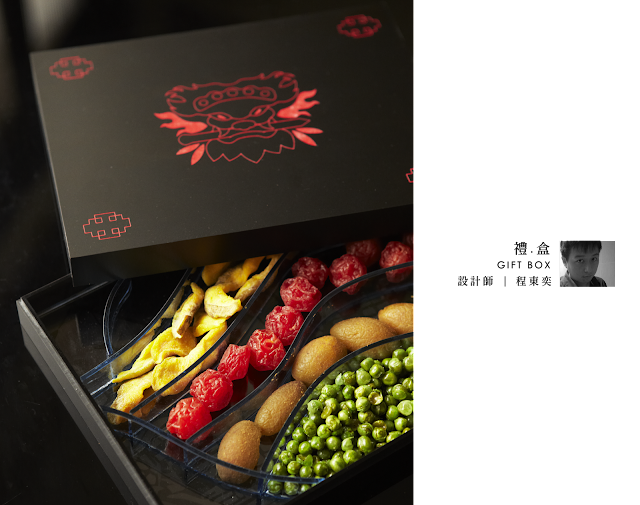 People who visit Tainan, they all want to bring back the local cuisine for their family and friends and share those delicious food in a delicate box, and that is the designing inspiration of "Gift Box". 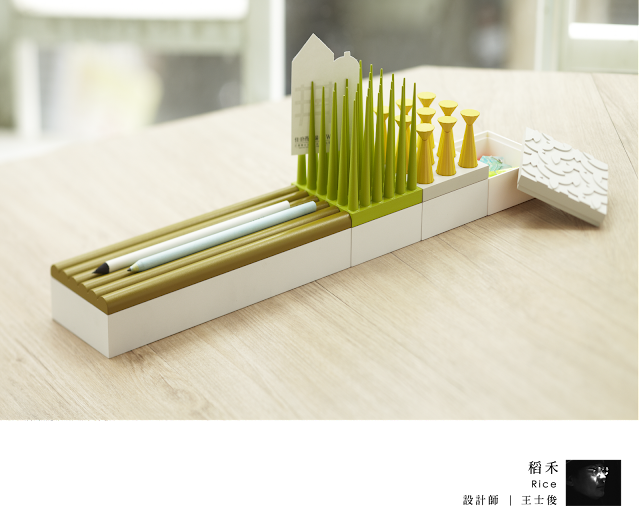 The square box design represent Tainan and divided into five components represent the "five ports" showing the diversity cultures in Tainan. People can attach different items on the cover of the box in order to show their own personal feeling of Tainan. In Tainan, taking a walk in small streets always has surprises. We can find temple, churches, and historic relics behind large buildings when turning around into a street. When we make another turn, we can see traditional shops and old monuments standing beside new houses. In Tainan, there is full of elegant and attractive landscape waited for people to find up. According to this beautiful landscape in Tainan, I create a set of silver rings built of many architecture and plants. Therefore, we can have an imagination of taking a walk in Tainan when we wear them. Tainan is a place full with harmony formed by its diverse conflict; the clash between tough canvas tote and the delicate embroidery is just a way to pay the tribute to legendary naïve artist Hung Tong, Hung Tong lived his whole life exclusively at small fishmen village at Tainan, thus he never received the formal training in drawing, he has amazed the crowd with his one of a kind style that full is with vivid colours and detail lines. The first ray of sun into the room in Tainan County feels differently with what is felt in Taipei City. The translucent beam transpires sensation of freshness as a gift of Tainan to its visitors. 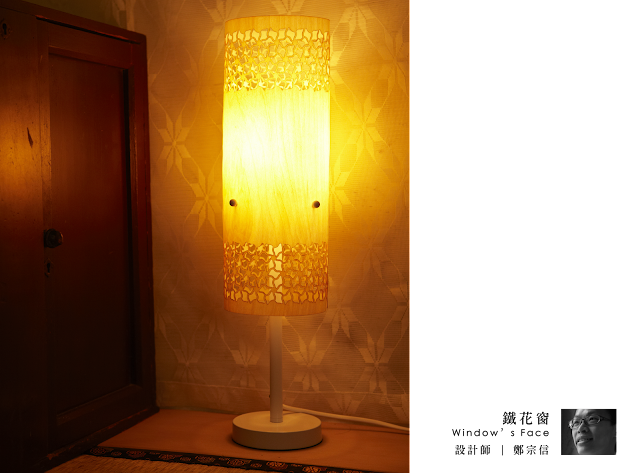 Having a piece of portable glass window with the carving work of a traditional Tainan craftsmanship, Memory of Light can bring to the city dweller of a moment of clearness in the heart. Tainan retain many old houses, and also leave a lot of different styles of window railing culture. 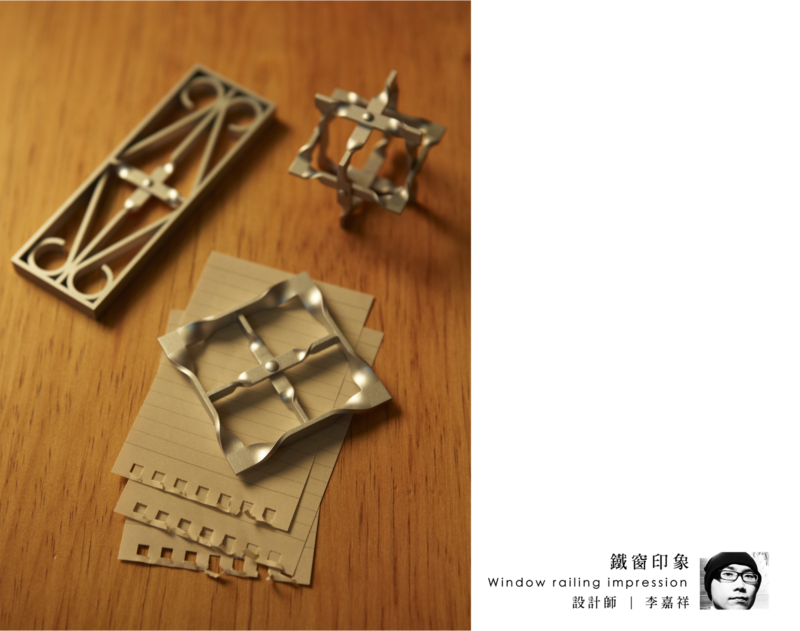 Use the most common elements of the window railing to create paperweight. 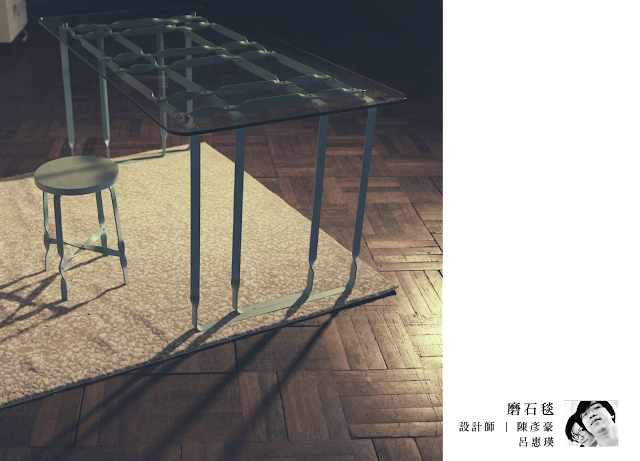 Turn the image of protection and inside/outside into the image of accommodating and stable thing on desk. 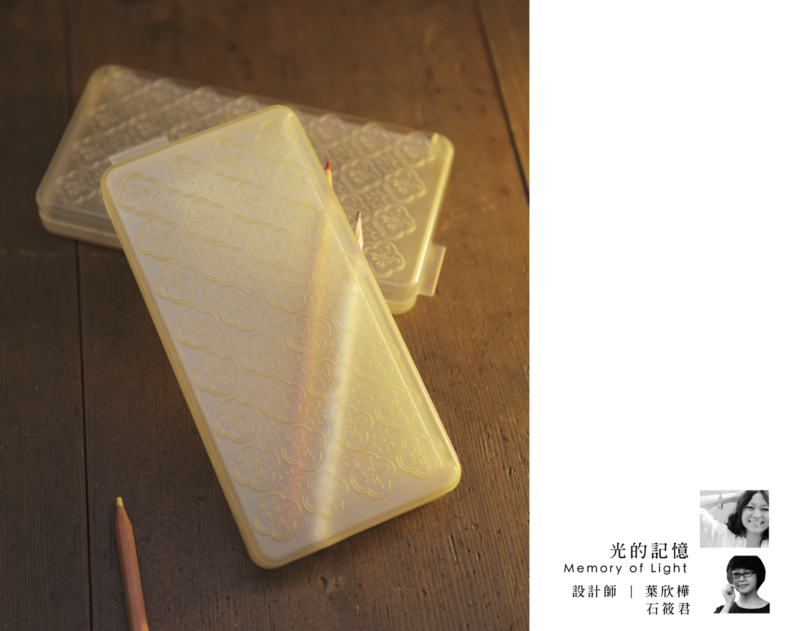 The lucky charm sleeve of historic city –carrying your good luck and blessings! Tainan, an ancient city survived Japanese Colonial Period and colonized by Dutch, is surrounded by historic stories and antique buildings recorded in textbooks; However, what really embeds in my memory and my childhood is the experience of Bai Bai. Since I was young, my family have been going to sheng mu miao praying for blessings annually that symbolizes bad luck going away and looking forward to a new year full of hope! When I feel frustrated in strange land, my hometown always supports me; it makes me eager to go back tosheng mu miao for peace in my mind just like being supported by my own family. Bai Bai, is usually for personal wishes, praying for blessings, and making dreams come true. 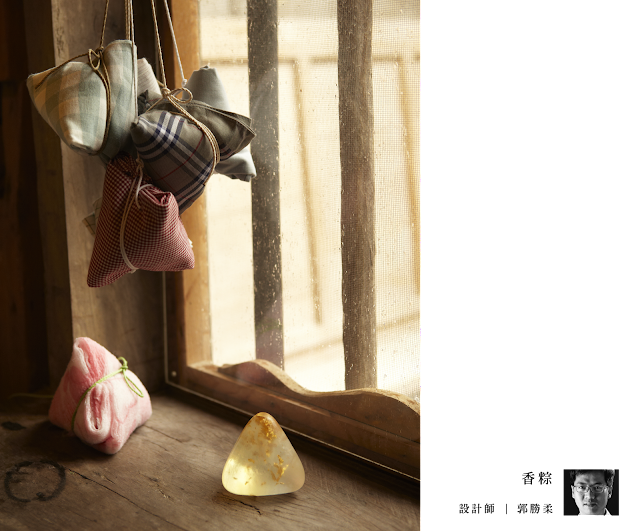 When you finish Bai Bai, you can have a lucky charm blessed earnestly and can be carried with you everywhere. At first, you would put the charm into your carrying bag, but it always is gone or lost eventually just like you lose the magic. Travel size for easy carrying, Double-layer design can be placed through the tea leaves or tea bag, and there are special tea spoon. 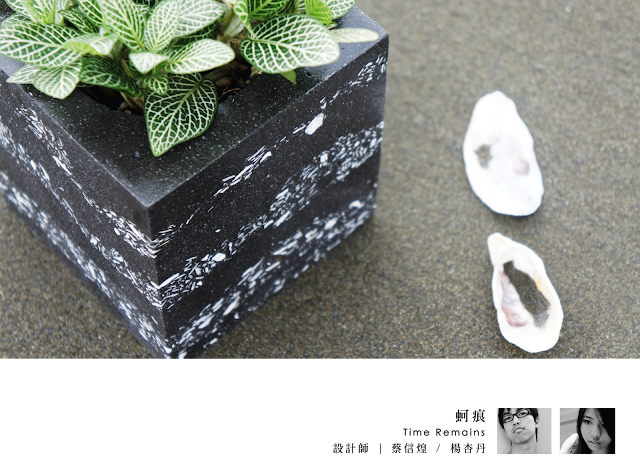 Zinc products with special textures, and showing a primitive style with a hemp rope. Presenting is an action between two persons. The moment when two persons have emotional communication by giving and receiving presents is what presenting is all about. One have to give presents, and the other have to receive presents. Therefore, "give & receive" is a present bag which has two parallel grips. One is for presenter, and the other is for presentee. 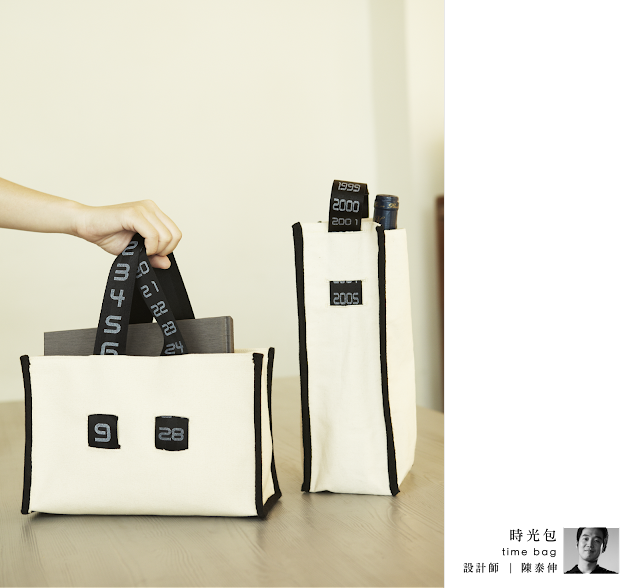 By opening the bag, the two grips will combine into one, and the bag will transform into a shoulder bag. 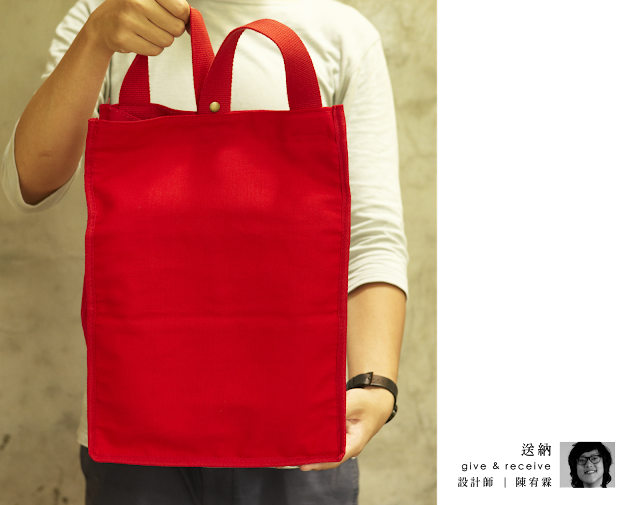 Therefore, it will be easy for presentee to carry presents, and the bag can also be reused as a shoulder bag for daily carriage. In order to represent the temple in the cup, I use the dark clay to symbolize the columns. The patterns on the side of the cup are influenced by the tradition when people will decorate red fabric with historical embroidery and place above the door to bring luck. Other classic types of embroidery will be used in my design, all are inspired by different traditions such as praying to Confucius for good luck in exams, praying to Kuan for justice, praying to Matsu for peace. In that way there is a cup for all occasions. 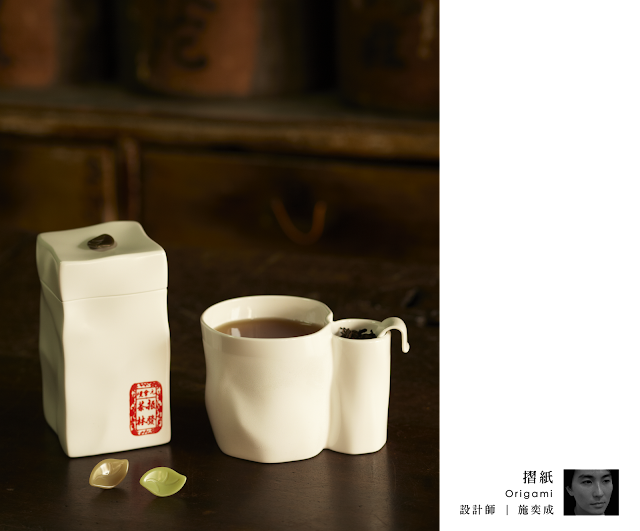 Therefore, the blessing cup is a practical gift with strong culture meaning. 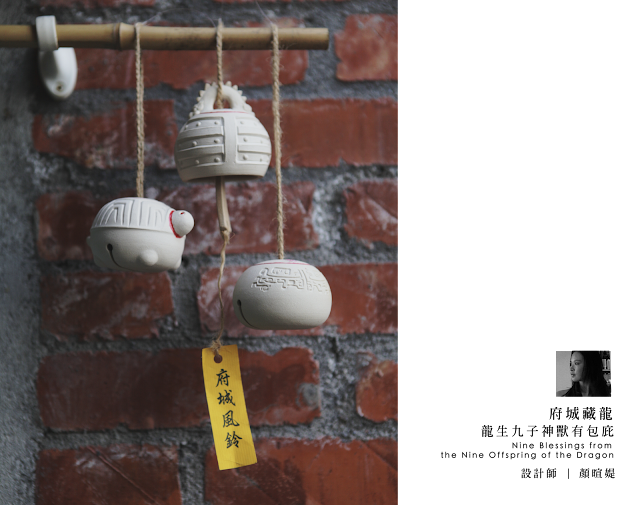 "Gift giving is a very important culture practice amount Taiwanese society; Tainan is “City of Etiquette” and with its abounded population of temples, there grows the strong linkage between the symbolic meaning of gift and religious belief. 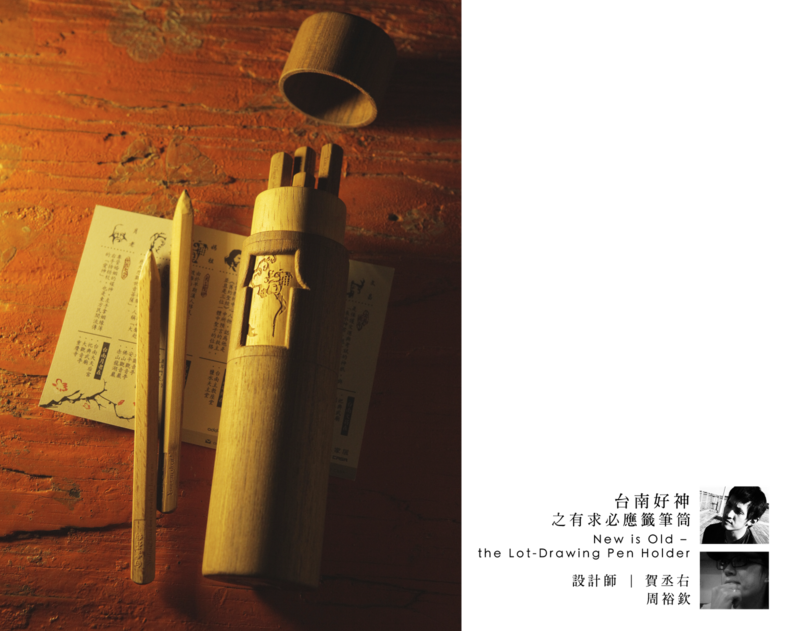 This souvenir is for temple of Great Master Confucius and its design is taking the spoonerism of Zongzi as good luck to student who is going to exam. I've always been drawn to old things, old things expand my imagination, and I enjoy listening to folk stories and being moved by them. I was lucky to grow up in Tainan, a historic and intimate place full of surprises. What I remember most about Old Tainan is the vibrant street life, full of tradition, where you can not only see but feel the energy of the the city.After I left Taiwan, Tainan remained strong in my memories, especially its friendly people, unique culture, rich history, and simple pace of life. Luckily, I have always had the support and understanding of my husband Chin Ko, and when I described my impression of Tainan, he created colorful artistic interpretations of my memories. Through these illustrations, I hope that you will take a moment to rediscover and enjoy this beautiful city and its people. wooden lid. The magpie can be used to retrieve tea leaves from the jar. 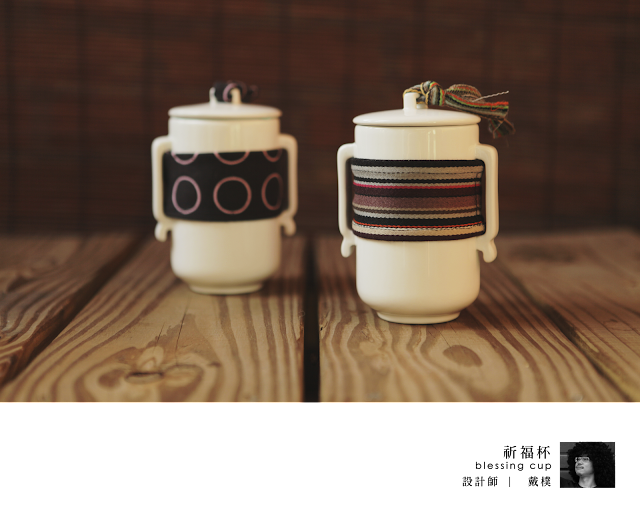 “Early birds drink tea!” says the designer. Morning tea is an excellent choice of beverage for “waking up the brain,” as an alternative to coffee. Dui is a type of Chinese bronze vessel that was used in the Warring States period of Ancient China. 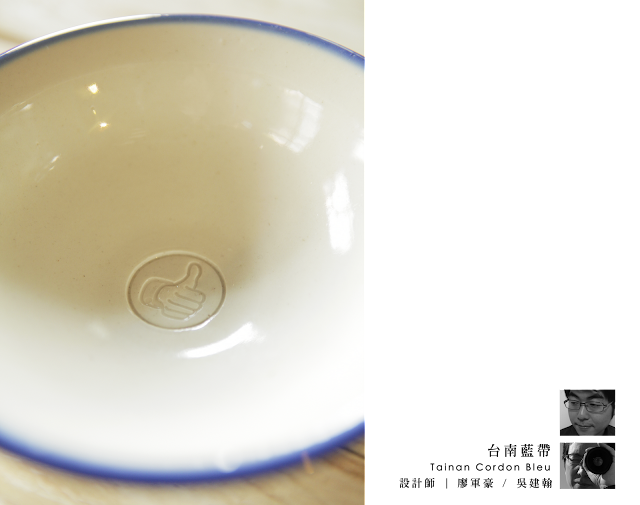 It's a special food container that used to be used in religious rites to show the respect for gods. Even in nowadays Taiwanese religious culture, when we worship gods, we still prepare some special dishes to put the various fruits and food just for the ritual. 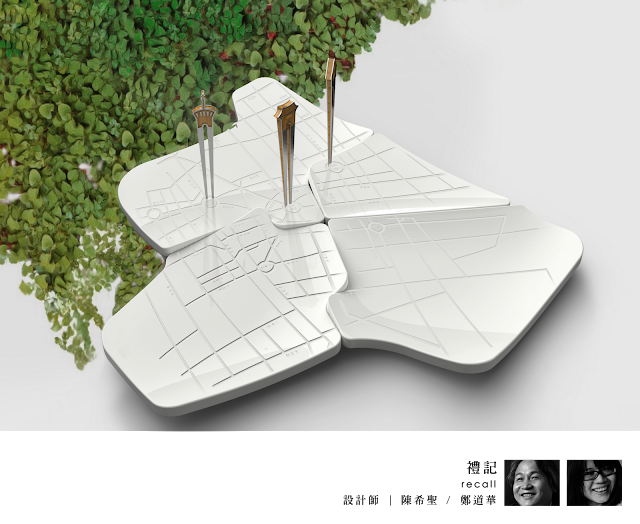 So I would like to use the idea of Dui into my design and develop a portable "Food Tower". 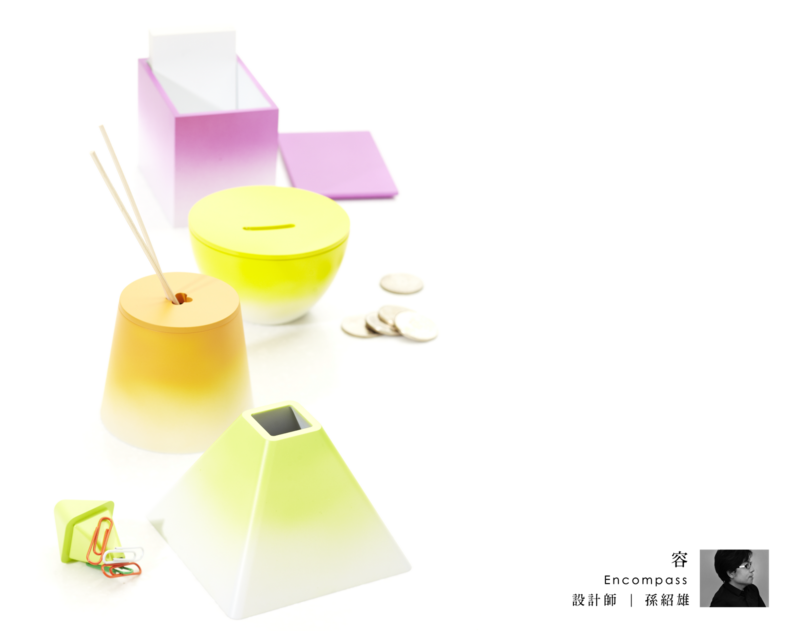 Food Tower is a food container that is put up by several small containers, so you can put different food in different container, and when you take them apart, there are also beautiful small dishes that you can use for ritual or luxury lunch box.